CHF Construction is your local construction company, based in Wantage, Oxfordshire. But we're not just about bricks and mortar. We're very much aware that we're building our customers' future, so appreciate the importance of clear, honest pricing and value for money. In these difficult financial times where confidence in the money and property market in general is being eroded, we realised that a fresh new approach to building projects would give clients more confidence to proceed - so in 2011 we adopted our "open book" pricing approach. This means exactly what it says - we share all our costs and hard-won trade discounts with you, both for materials and labour charges. We charge a weekly management fee, depending on the size of the project, and then a percentage mark-up across the board, which is fully agreed and transparent prior to the commencement of the project. One advantage of this way of working is that any extras or alterations are not subject to an inflated mark up. We then simply agree an overall profit margin which applies right across the project, giving you confidence and peace of mind by passing on exceptional pricing direct from local suppliers to you. We also often manage to reduce the overall VAT bill for our projects, through a company project management approach. We take overall ownership for the entire project, but then allow you to pay much of the labour costs directly to the contractors, many of whom are not VAT registered. This could save you up to 20% on the total labour costs depending on the scale and nature of the project. This innovative pricing policy has helped us grow our business and reputation over recent years, and we look forward to working with you. We are very happy to provide responses to competitive tenders - please contact us for further details. 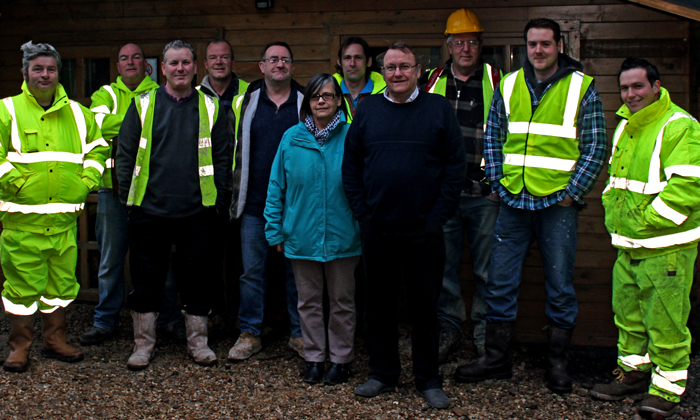 CHF Construction is a well-established company working in Wantage and the surrounding area. Following completion of many successful projects, we can say with confidence that we have both the experience and expertise to realise any construction or renovation project that you have in mind. We're a general contractor, and will work closely with you and experienced architects, ensuring your wishes are fully accommodated throughout the project. Drawing on our extensive experience, we may often advise on alternative less costly, or maybe speedier solutions to meet your project goals, without compromising quality. CHF Construction company's core values of quality, efficiency and reliability, are playing their part in building a first-class reputation in the industry by successfully delivering high-quality projects. We're proud that we've maintained our strong belief in good workmanship and a job well done. Whatever the size of the undertaking, our whole team is aware of their responsibility for excellence, safety and respect for the environment. CHF Construction knows that people are our main asset, and we always strive to create the best possible working environment for our team, fostering continuous training and development with a strong emphasis on health and safety. "A local trusted construction partner"
The BavTrac 025 is for hire with a 3.5 ton excavator to load it, and an experienced operator. This machine will crush up to 15 ton per hour of concrete, brick, block, and rock.